One of the major categories of dental marketing is internet dental marketing. It is important because this is how prospects find your website. It doesn’t matter how well your site is optimized without some combination of internet dental marketing your site will experience low traffic. Once the site has been formatted with original content, the on-page optimization can begin. This involves using keywords/keyword phrases that your “ideal prospect” would use to search for an organization such as yours. We coordinate these keywords throughout the site in your title tags, page URL’s, meta descriptions, meta tags, headers, throughout the body copy. When Google and the other search engines crawl your site they index each page based on the meta data. When someone enters a search term/phrase the search engines loads the most relevant site. Now that you have a well optimized site we begin the marketing process with blog posting. Writing about topics your prospects are interested in is the best way to keep them engaged. Blogs are based around a keyword or keyword phrases and are optimized as well, linked and integrated with your website. Each time you write a post it adds a page to your site, Google loves this. Once a blog post is written, we use social media posts to spread the word. We optimize the social posts so they integrate with the blog and integrate with the website. We tailor each post to the individual social media platform so it can perform well. Or pay-per-click. We believe if you have done everything correctly above you will not need to invest more in paid search. To do paid search well, you need to invest about $75 a day, every day, to get a return on your investment. Terms can range from $3 a click, up to $30 a click. Some schools of thought see PPC as the icing on the cake once you rank well organically and on the Google local maps. Review sites e.g. as Google+, Yahoo Local, Facebook, Yelp, Healthgrades, Dr. Oogle, Rate MD’s, Vitals…, are becoming more important to ranking well with the search engines. Also, these sites need to be monitored for comments and bad reviews to keep you on top of what people are saying and responding to neutralize any bad comments. Online ads are having a comeback due to advancements in targeting technology. Now you can be so granular in reaching prospects, say prospects within a 5 mile radius of your office who are interested in Invisalign invisible braces. What’s more, after they searched for the term or clicked on the ad you can remarket to them for a determined period of time to stay “top of mind” as they go through the decision cycle. Local search involves setting up profiles and linking them to your site. We use a combination of 40 directory sites e.g. LinkedIn and review sites e.g. Yelp. It is important to use a consistent profile among each of the local sites to maximize optimization. The goal is a listing on Googles 3 pack. In a competitive environment, it is a must you use ongoing SEO to stay ahead of competitors. Once the site settles after launching we apply various Premium SEO techniques to address the dynamic nature of search engine algorithms, competitor’s rankings, changes in keyword(s) usage, added/moved content… Also provide reports and explanations of Google analytics. Use Call-to-action pieces to capture prospect contact info; then follow up with an email lead nurturing campaign to move prospects thru the buying cycle to conversion. It is best to have a consistent approach to using these dental internet marketing programs, so your practice always have an online presence, to drive traffic to your site and keep the phone ringing. We are ready to help you set up and implement these programs into your practice. We work with dental practices locally and nationally on all phases of internet dental marketing and can work virtually with ease. I believe we have a better pulse than most of our competitors. I see a lot of corporate dental marketing companies who have developed their own system, that look fancy-schmancy but never perform very well in the search rankings. We only use experts who are dedicated to each one of these internet dental marketing programs. 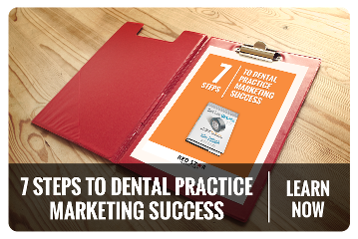 Go here to learn more about dental internet marketing. Now that you know how to drive customers to your dental website with internet dental marketing check out our page on dental websites.